There is nothing sexier than a man with a chicken. OK, there are lots of things sexier than that, but still. Are these guys cute or what? 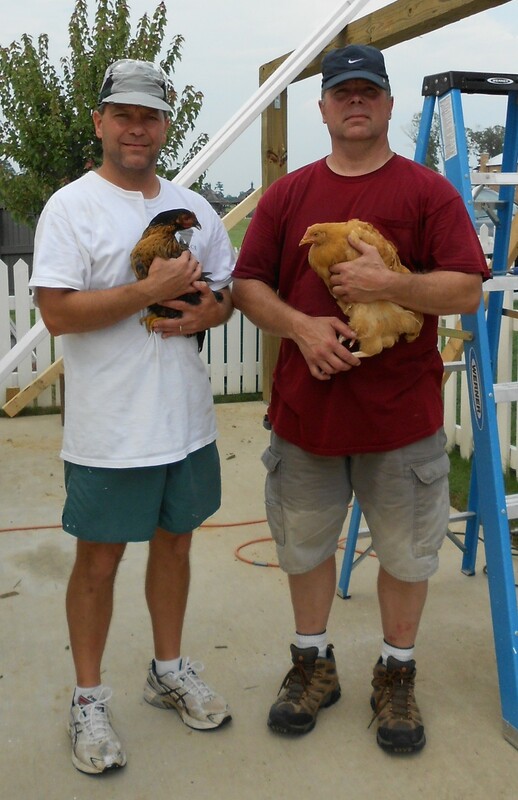 During a lull in the construction project, the Burlingame boys took a break for a photo shoot with Daisy & Violet. This was the first time Uncle Dave had ever held a chicken! Can you believe it? He looks like he holds chickens every day! What a pro. The roof is coming along slowly, but that’s fine with the girls. As long as there are two hulking, sweaty men in the back yard they are safe to free-range all the day long. Dave leaves tomorrow and I’ll have to start thinking of another project to lure him back to Alabama. I plied him with cheesy grits this morning. I hear you can’t get those in Pennsylvania. Analysis of hunks holding chickens: Jim likes the brunette, quirky chicks who think outside the box. Dave prefers blondes with big breast (hey, we’re still talking chickens here.) ok been I’ve in sun too long…back to my yardwork.